There are words from other languages that have been incorporated into English because English is limited in its ability to quickly summarize vague emotions or broad contexts. Words like schadenfreude, kowtow, and aficionado all come from languages other than English because they filled a need -- expressed an idea that English had yet to contain. Once devoured by English, though, the language confines it with connotations that otherwise would not have existed prior. Spirituality is one of those regions where the lexicon of English especially fails. Having so much of its development under the auspices of Christianity, English has a limited view of spiritual connectedness. Rather, it focuses on the struggles of the day-to-day and the rewards of an afterlife. When English speakers seek some other sort of spiritual sensibility, they find their vocabulary constrained and often have to turn to other languages in order to express that which they wish to explore. By stepping out of the confines of English, native speakers discover not only new words but new ideas and new ways of looking at the world. In doing so, perhaps, they gain fresh insights and, more importantly, original stories to make sense of existence. 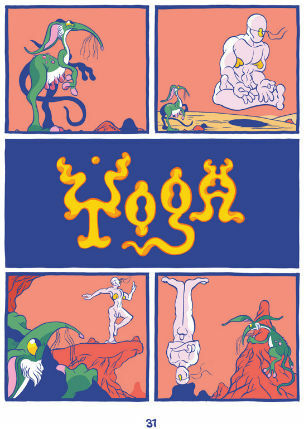 All of this leads to, finally, a review of SUTRA: SONGS FROM THE WORLD OF OM by Andy Barron. 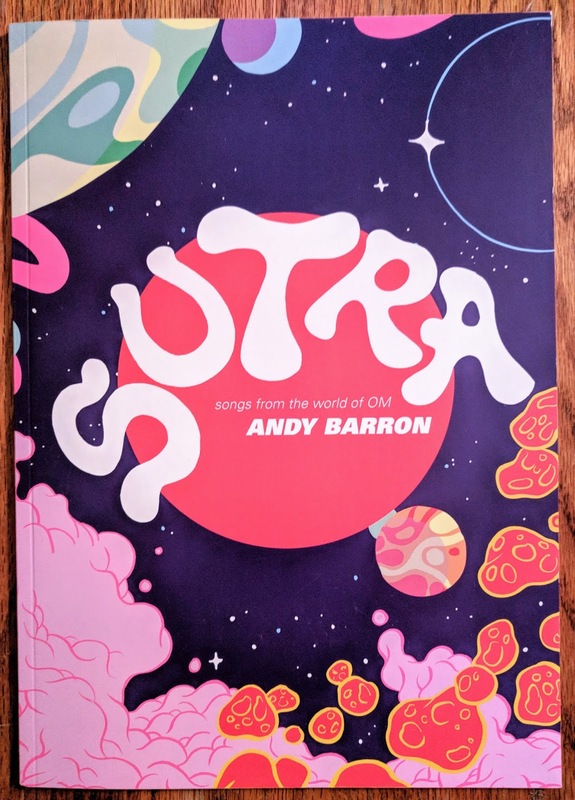 In Hinduism, a sutra is “a collection of aphorisms relating to some aspect of the conduct of life.” In Sutra’s 46 pages of beautifully colored cartooning, Barron collects seven wordless short stories all taking place in a fantastic world he has created called Om. Each of Sutra’s short stories acts as an aphorism and, while interconnected, stands on its own in terms conveying meaning, theme, and understanding. There’s both a charm and a grotesqueness to Barron’s cartooning. Flushed in vibrant pinks, reds, and purples, there’s a fluidity to his character design and world building. Everything has rounded edges, density, and even a certain moistness, all of which helps Barron shape his characters and clearly define their emotions. 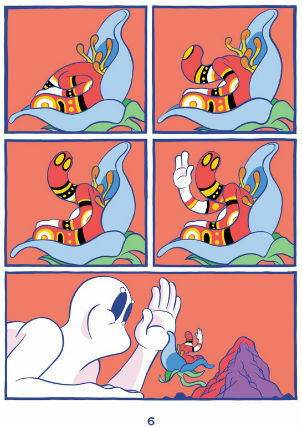 Wordless comics demand a deft hand on the part of the cartoonist in order for any semblance of narrative to work. Barron has that hand, everything he does is in service of story, and, in that, in service of theme. Much is made of cycles in Sutra. One of the stories in the book is even called “Samsara,” another Sanskrit word which refers to the cyclical nature of death and rebirth that all creatures are bound to in the material world. In Barron’s world, forces work in rhythms, sequences, and successions. That which dies gives birth to something new. Dictatorial rule is undermined by a natural law. Avarice is punished by community. In Sutra, Baron conveys his themes through his storytelling which is manifested through his art which, here, is presented as songs. These are songs of experience. They are songs of innocence. They are songs of myself. They are large, and, in the parlance of the times, they contain multitudes. And yet even as he preaches, Barron never falls into didacticism or moralizing. Much as with the rounded edges of his cartooning, there is a softness to his message. As striking as the contrasts are in Sutra between good and evil, justification and “rightness” flow from some larger source than just dictates and rules cobbled together in order for society to function. Rather, in Sutra, morality is based on patience and quietness, meditation and rhythm. The world of Om rights itself when it is allowed to proceed unimpeded, neither overthought nor overwrought. By borrowing its title from another language, Sutra opens doors to thinking that may have been previously unavailable to English speakers. By placing it in a spiritual context, it forces readers to move past the concerns of the physical. By making the comic wordless, Barron chooses to allow all languages to be heard. By exploring the ideas in the manner that it does, Sutra responds with beauty to the rising authoritarianism being swung like a bludgeon in so many modern Christian nations, giving a quiet voice to empathy, kindness, and love.